^ 1.00 1.01 1.02 1.03 1.04 1.05 1.06 1.07 1.08 1.09 1.10 1.11 1.12 1.13 1.14 1.15 1.16 1.17 1.18 1.19 1.20 1.21 1.22 1.23 Miles B. Lawrence and Hugh D. Cobb. Hurricane Jeanne Tropical Cyclone Report. National Hurricane Center. 2004-11-22 [2014-04-09]. （原始内容存档于2014-01-21）. ^ Pasch/Stewart. Tropical Depression Eleven Discussion One. National Hurricane Center. 2004-09-13 [2014-04-09]. （原始内容存档于2012-10-21）. ^ Jarvinen. Tropical Depression Eleven Discussion Two. National Hurricane Center. 2004-09-14 [2014-04-09]. （原始内容存档于2012-10-21）. ^ Stewart. Tropical Storm Jeanne Discussion Four. National Hurricane Center. 2004-09-14 [2014-04-09]. （原始内容存档于2012-10-21）. ^ Stewart. Tropical Storm Jeanne Discussion Five. National Hurricane Center. 2004-09-14 [2014-04-09]. （原始内容存档于2014-01-02）. ^ Beven. Tropical Storm Jeanne Discussion Eight. National Hurricane Center. 2004-09-15 [2014-04-09]. （原始内容存档于2014-01-02）. ^ Jarvinen. Tropical Storm Jeanne Discussion Six. National Hurricane Center. 2004-09-15 [2014-04-09]. （原始内容存档于2012-10-21）. ^ Beven. Tropical Storm Jeanne Discussion Nine. National Hurricane Center. 2004-09-15 [2014-04-09]. （原始内容存档于2014-01-02）. ^ Stewart. Tropical Storm Jeanne Discussion Ten. National Hurricane Center. 2004-09-16 [2014-04-09]. （原始内容存档于2012-10-21）. ^ Avila. Tropical Storm Jeanne Discussion Fifteen. National Hurricane Center. 2004-09-17 [2014-04-09]. （原始内容存档于2012-10-21）. ^ Pasch. Tropical Storm Jeanne Discussion Fourteen. National Hurricane Center. 2004-09-17 [2014-04-10]. （原始内容存档于2012-10-21）. ^ Beven. Tropical Storm Jeanne Discussion Twenty-Two. National Hurricane Center. 2004-09-19 [2014-04-10]. （原始内容存档于2012-10-21）. ^ Avila. Tropical Storm Jeanne Discussion Twenty-Four. National Hurricane Center. 2004-09-19 [2014-04-10]. （原始内容存档于2012-10）. ^ 22.0 22.1 Stewart. Tropical Storm Jeanne Discussion Twenty-Eight. National Hurricane Center. 2004-09-20 [2014-04-10]. （原始内容存档于2012-10-21）. ^ Stewart. Hurricane Jeanne Discussion Twenty-Nine. National Hurricane Center. 2004-09-20 [2014-04-10]. （原始内容存档于2012-10-21）. ^ Beven. Tropical Storm Jeanne Discussion Twenty-Six. National Hurricane Center. 2004-09-20 [2008-06-27]. （原始内容存档于2012-10-21）. ^ Beven. Hurricane Jeanne Discussion Thirty-One. National Hurricane Center. 2004-09-21 [2014-04-10]. （原始内容存档于2012-10-21）. ^ Stewart. Hurricane Jeanne Discussion Thirty-Six. National Hurricane Center. 2004-09-22 [2014-04-10]. （原始内容存档于2012-10-21）. ^ Beven. Hurricane Jeanne Discussion Thirty-Nine. National Hurricane Center. 2004-09-23 [2014-04-10]. （原始内容存档于2012-10-21）. ^ 28.0 28.1 Stewart. Hurricane Jeanne Discussion Forty. National Hurricane Center. 2004-09-23 [2014-04-10]. （原始内容存档于2012-10-21）. ^ Avila. Hurricane Jeanne Discussion Forty-Two. National Hurricane Center. 2004-09-24 [2014-04-10]. （原始内容存档于2012-10-21）. ^ Stewart. Hurricane Jeanne Discussion Forty-Four. National Hurricane Center. 2004-09-24 [2014-04-10]. （原始内容存档于2012-10-21）. ^ 31.0 31.1 Stewart. Hurricane Jeanne Discussion Forty-Five. National Hurricane Center. 2004-09-24 [2014-04-10]. （原始内容存档于2012-10-21）. ^ 32.0 32.1 Beven. Hurricane Jeanne Discussion Forty-Seven. National Hurricane Center. 2004-09-25 [2014-04-10]. （原始内容存档于2012-10-21）. ^ 33.0 33.1 33.2 Pasch. Hurricane Jeanne Discussion Fifty. National Hurricane Center. 2004-09-26 [2014-04-10]. （原始内容存档于2012-10-21）. ^ Jack Beven. Hurricane Frances Tropical Cyclone Report. National Hurricane Center. 2004-12-17 [2014-04-10]. （原始内容存档于2014-02-03）. ^ National Climatic Data Center. Event Report for Florida. 2004 [2011-05-20]. （原始内容存档于2011-05-20）. ^ 36.0 36.1 National Climatic Data Center. Event Report for Florida (2). 2004 [2011-05-19]. （原始内容存档于2011-05-19）. ^ 37.0 37.1 37.2 David Roth. Rainfall Summary for Hurricane Jeanne. Hydrometeorological Prediction Center. 2006-12-30 [2014-04-10]. （原始内容存档于2013-09-21）. ^ Beven. Hurricane Jeanne Discussion Fifty-One. National Hurricane Center. 2004-09-26 [2014-04-10]. （原始内容存档于2012-10-21）. ^ Stewart. Tropical Storm Jeanne Discussion Fifty-Four. National Hurricane Center. 2004-09-27 [2014-04-10]. （原始内容存档于2012-10-21）. ^ Charleston, South Carolina National Weather Service. Hurricane Jeanne Post Tropical Cyclone Report. 2004-09-30 [2014-04-10]. （原始内容存档于2012-02-07）. ^ Storm Prediction Center. 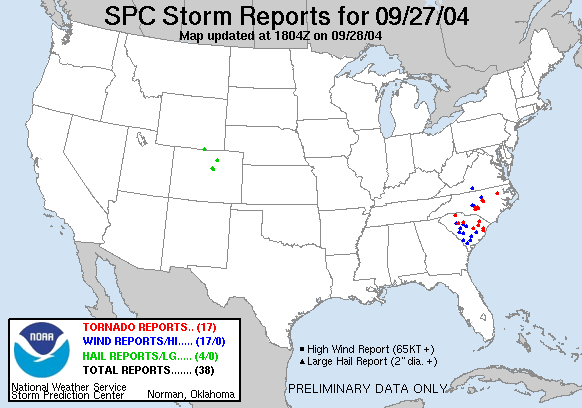 Storm Reports for September 27, 2004. NOAA. 2004-09-27 [2008-07-06]. （原始内容存档于2012-06-12）. ^ Mount Holly, New Jersey National Weather Service. Rain/Tornado - Remnants of Hurricane Jeanne. 2004-09-28 [2014-04-10]. （原始内容存档于2013-03-17）.